If you’re looking for an easy way to root your Android device and aren’t familiar with fastboot or ADB, then look no further. The Nexus Root Toolkit by WugFresh has been updated to support Android 4.3 as well as the 2013 Nexus 7. 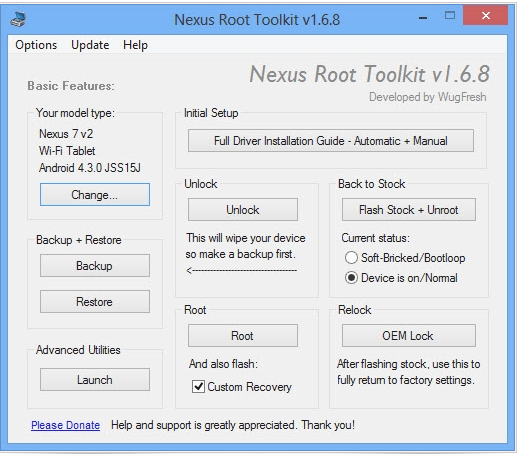 Nexus Root Toolkit will unlock, root, relock, and return your Nexus device back to stock if the need would ever arise. The Nexus Root Toolkit is much more than just a rooting and unrooting tool. NRT allows you to easily backup and restore data, flash additional zip files, set file permissions, install apps, generate logcats, and much more. NRT will even install the correct drivers for you and download the correct Nexus factory images directly from Google. It’s really that simple. Please remember, this toolkit is only for Nexus devices. It will not work on your device if it is not listed below. Please proceed with caution. To get started, head on over to the official Nexus Root Toolkit site to download the latest version of NRT. Once downloaded, just install the application and follow the instructions. With a few clicks of your mouse, you’ll be automating your Nexus root experience. Good luck!